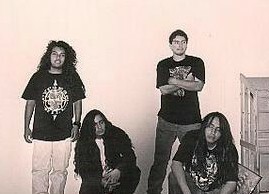 nausea Nausea are a grindcore/death metal band formed in Los Angeles, California, in the late 1980's. Founding members Oscar Garcia (vocals/guitar) and Eric Castro (drums) have now regrouped the band with the addition of original Terrorizer member Alfred "Garvey" Estrada on bass and vocals. Split demo with Terrorizer. Xeroxed covers. Came with a booklet with history and lyrics. - Will It Ever End? Xeroxed covers. No lyrics. Regular tapes. Recorded live 1991.